Posted on June 17, 2014	by Katy K.
Starling by Sage Stossel. InkLit, 2013. Amy was recruited as an official superhero – Starling – shortly after she knocked out a would-be kidnapper with electricity from her fists. While it was a great ego boost, it’s still an unpaid position. Now an adult, Amy is trying desperately to hold on to her marketing career, despite frequent pages at inopportune moments that she tries to disguise as irritable bowel syndrome, and a colleague who’s all too willing to take advantage of her absences. Just to make her life even more out of control, her brother Noah has given up even trying for a job and is sleeping on her sofa. Also, the ex-boyfriend she broke up with after she accidentally knocked him out is flirting with her, even though his current girlfriend is really nice herself. In a soft-hearted moment, Amy as Starling redirects some criminals towards a better life instead of turning them in, and now all sorts of unsavory people are looking for her in the hopes of similar assistance. 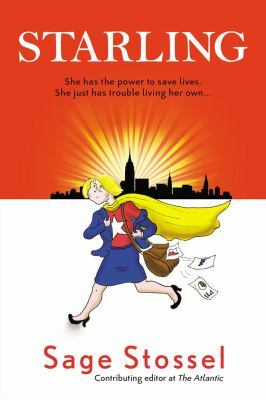 Is there such a thing as work-life balance when you’re trying to balance not just regular life and work, but also a superhero career? Although Amy/Starling is a superhero, and we see some of her exploits, the focus is on her tangled real life. The simple ink and watercolor art and regular grid back this up. This didn’t grab me quite as much as I was hoping, but it still manages to be heartwarming and funny at the same time. I put it in the adult collection at the library, since it’s about an adult, but as there’s no Objectionable Content, it would be perfectly appropriate for teens as well. This entry was posted in Books and tagged adult graphic novels, superheroes, teen graphic novels. Bookmark the permalink.